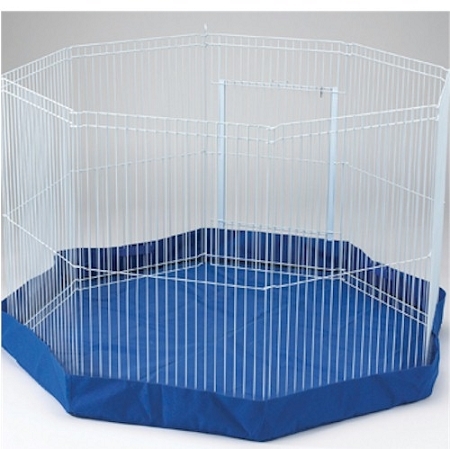 Features: Dimensions: 44" W x 44" D x 4" H Quality waterproof/stain resistant canvas material Easily attaches with velcro straps Use under playpen to prevent messes Use on top as an outdoor sun shade The Clean Living Small Animal Playpen Cover is a necessary accessory for the Clean Living Small Animal Playpen. It will make clean up one hundred percent easier and more sanitary. It is made of water-proof, stain resistant canvas. It easily attaches with velcro straps. Your small pet will love the freedom almost as much as you will love not worrying about the mess on your floor! Get one to cover the floor to prevent messes;and a second one to cover the top as an outdoor sunshade.